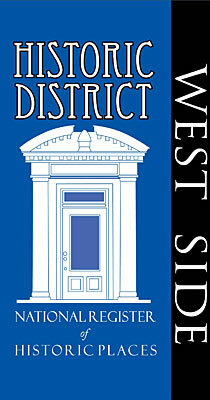 Located one block to the west of the commercial center of downtown Hendersonville, the West Side Historic District is bounded roughly by Washington Street on the east; Blythe Street on the west; the northern property boundaries of lots on Fifth Avenue West, Oak Hill Court, and Florida Avenue on the north; and the southern property boundaries of lots on Third Avenue West and Fourth Avenue West on the south. Boundaries of the district were drawn based upon concentrations of contributing buildings, along with detailed research into the historic plats that guided the development of the neighborhood from the early 1900s to the late 1940s. The topography of the neighborhood consists of a series of gently rolling hills with many houses set level with the street, along with several which are set up on hillsides with stone retaining walls to the front. New commercial, institutional, and residential development surrounds the district to the north, south, and west, with many modern medical office buildings framing the northern edge of the district along Fifth Avenue. The commercial core of Hendersonville, including the Main Street Historic District, is located to the east of the neighborhood. The nominated district consists of 244 contributing houses and outbuildings, one contributing school building, ninety-nine non-contributing houses and outbuildings, eight non-contributing structures (freestanding carports), and five vacant lots. Most of the non-contributing buildings were built after 1951 and therefore fall outside the period of significance. Some of the non-contributing buildings were built during the period of significance, but have undergone extensive modern architectural changes and therefore do not have sufficient integrity from the historic time period. The district covers approximately 111 acres, and incorporates a number of separate subdivision developments dating from 1917 to 1951, many of which were originally large land holdings of individual property owners that pre-dated the extensive residential development of later years. The layout of most of these subdivisions utilized a typical grid plan, which was often employed to subdivide land due to its ease of layout and conformity in size of lots. Many lots in the West Side Historic District are fifty to one hundred feet wide, level with the street, and some are raised above street level on the gently rolling hillsides evident throughout the neighborhood. Stone retaining walls of either rough cut granite slabs or cut granite blocks delineate these elevated lots throughout the historic district. Exceptions to the generally small lots are the Jason K. Livingston House at 1235 Fifth Avenue West; the Columbus Mills Pace House at 813 Fifth Avenue West; the Charles A. Hobbs House at 1230 Fifth Avenue West; the William M. Sherard House at 1110 Fourth Avenue West; the Junius Anders House at 910 Fourth Avenue West; and the John G. Grant House at 816 Fourth Avenue West. Most of these lots are large corner lots approximately 400 feet wide by 200 feet deep, with the houses set back on the lot, often on the crest of a hill, and in some cases hidden from the street by large evergreen or deciduous trees. An exception to the corner lots is the Columbus Mills Pace House which is located in the middle of the block bounded by Whitted and Oak streets, and occupies almost half of the block. Of these larger houses, one of the most notable landscapes is at the Charles A. Hobbs House, with a large open front lawn and an extensive rear garden with numerous perennial gardens and a formal patio. Some of the most notable granite retaining walls can be seen along the north side of Fourth Avenue, extending in front of the James Grey, Jr. House, the Abram Kantrowitz House, and the Lila J. Wooley House. Architectural styles and house types represented in the neighborhood are 102 bungalows, five front-gable cottages, thirteen side-gable cottages, six hip-roof cottages, one cross gable roof cottage, one vernacular double-pile house, two I-houses, seven Tudor Revival, sixteen Colonial Revival, two Dutch Colonial Revival, six Four Square, eight Queen Anne, two Shingle Style, five Neo-Classical Revival, two Spanish Colonial Revival, two Classical Revival, sixteen Ranch, twenty-three Minimal Traditional, eighteen modern, and five which have been altered so extensively the original style is no longer apparent. The majority of buildings are one-story, set in even rows lining both sides of the street, with some of the larger homes set farther back on the lots or up on the hillsides. Most houses are brick, with some use of shingles or weatherboard siding. The oldest house in the West Side neighborhood is the Columbus Mills Pace House (ca. 1860s), which pre-dates the development of the neighborhood and is notable, along with several of its original outbuildings, for being a highly intact example of a mid-nineteenth century house. Several blocks in the neighborhood were subdivided from the Pace property through the years. Other houses that appear to pre-date the major development period of the neighborhood include the Queen Anne style Wiltshire Griffith House (by 1912); Baker House (ca. 1910); Junius Anders House (ca. 1900); Lyda House (ca. 1900); and Claude M. Pace House (ca. 1910); the Neo-Classical Revival Jason K. Livingston House (ca. 1900); Mauney-Blythe House (ca. 1902); and Scheper House (ca. 1900); the I-house Mary Penland House (ca. 1890); the Colonial Revival style Roberts House ca. 1893); and John G. Grant House (ca. 1894); the Dutch Colonial Revival Sylvester Maxwell House (ca. 1910); and the Classical Revival Curtis-Burckmeyer House (ca. 1903). The first period of large-scale development within the West Side neighborhood occurred from the 1910s through the late 1920s. Many houses in the neighborhood were designed by prominent Hendersonville architect Erle Stillwell. Several are documented as his work based upon existing drawings in the Erle Stillwell architectural drawing collection, and others are noted as being likely to be his work based upon similarity of detailing and style to his documented buildings. Stillwell designed buildings in a variety of styles, but most of his commissions within the West Side Historic District are examples of the Classical Revival and Tudor Revival styles. The bungalows that he designed often included elements from these two styles within the basic form and massing of the bungalow. Some examples of Stillwell's work in the neighborhood are the Henry J. Quilhot House, Hedge-Burrowes House, the Oral E. Hedge House, Dr. Oswald Smith House, John W. Small House, Maxwell Apartments, Charles A. Hobbs House, Ambassador Apartments, James Grey, Jr. House, Abram Kantrowitz House, Dr. J. L. Egerton House, William M. Sherard House, Ernest Dodge House, and Rosa Edwards Elementary School, located near the east entrance to the neighborhood, facing Fourth Avenue West. The bungalow style is by far the most predominant style in the neighborhood, with several particularly notable examples. Some good examples of this house type are the Abram Kantrowitz House (1917) with a cross-gable roof, an engaged front porch with stone piers, and a solid stone balustrade; the Dr. J. L. Egerton House (1913) with shingle siding, a cross gable roof, and a wraparound porch with stone piers; and the Ashley H. Houston House (ca. 1925) with striated tan brick walls, a green tile roof, and multi-light casement windows. Particularly notable examples of the Tudor Revival style include the Hedge-Burrowes House (ca. 1925) with a multi-gable roof, round arch, multi-light casement windows, and a notable front door; and the William M. Sherard House (ca. 1925), an expansive house with prominent front gable with half-timbering, sunroom wings, and multi-light front door with sidelights and a fanlight, set on a large corner lot. * Notable examples of the Colonial Revival include the James Grey, Jr. House (ca. 1925) with a classically detailed front entry stoop, multi-panel front door with fanlight and sidelights, and a notable one-story garage; and the Charles A. Hobbs House (1922) with a side gable roof with boxed returns, round-arched dormers, one-story wings, shingle siding, classically detailed front doorway, and extensive landscaping. Two Neo-Classical Revival style apartment buildings are located in the neighborhood, the Maxwell Apartments (ca. 1920) and the Ambassador Apartments (ca. 1926). The Maxwell is the earliest apartment building in the neighborhood, followed by the Ambassador, with later development in the neighborhood including the construction of modern apartment buildings or the conversion of older buildings to apartments. While most houses were built during the primary period of growth in the neighborhood from 1910 to the late 1920s, there are several notable examples of houses dating from 1930 through the late 1940s, when there was a shorter period of development which took place in the neighborhood. Some notable examples of these include the side-gable cottage Luke A. Wingert House (1935), the Colonial Revival John W. Small House (ca. 1939), the Minimal Traditional Roy Creager House (ca. 1948), the John S. Forrest House (ca. 1943), and the Craftsman bungalow Oscar Latt House (1930). *Architectural drawing collection of Erle Stillwell. Located at Harley-Ellis Architects, Asheville, NC. Not accessible to the public. Many of the houses listed are documented within this inventory, and some are noted as possible designs of Stillwell based upon owner-provided information.